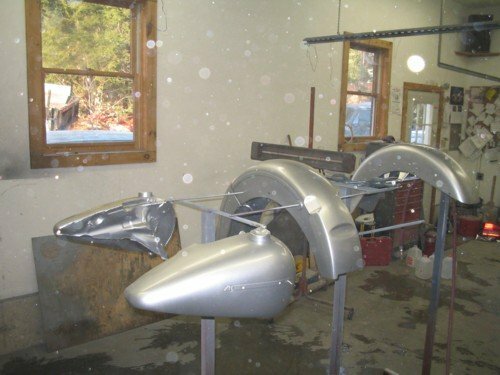 Step 1: This picture shows the stripped 1965 FLH Metal. 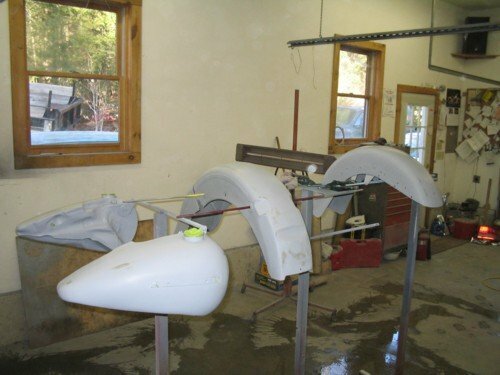 Front Fender has been hit several times, the tanks and rear fender are in fair shape. 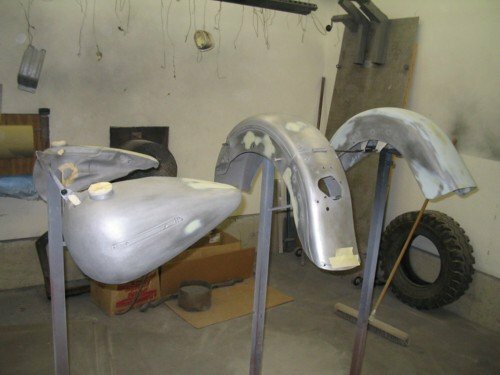 Front and rear fenders required several holes to be welded up. 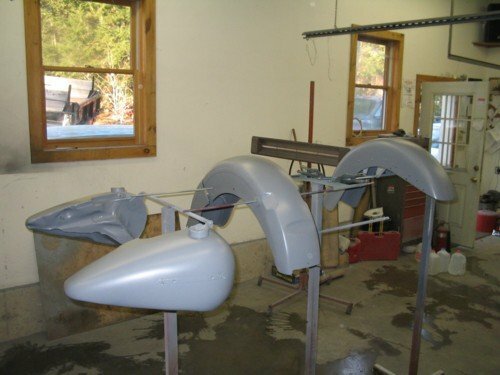 Step 2: All the parts receive 2 coats of zinc phosphate over the bare metal, this is followed by two applications of high solid urethane primer. 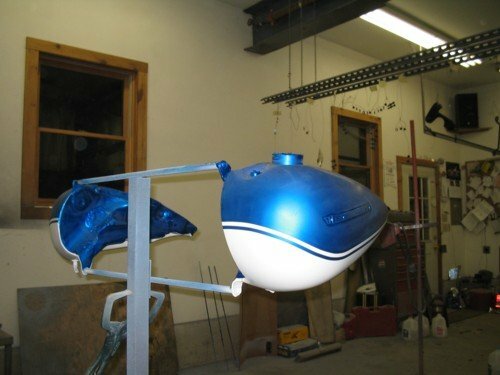 Step 3: Parts are block sanded, burn throughs of the urethane primer are re-zinced, and receive two more coats of high solid urethane primer. Step 4: Parts are finish sanded with fine grit paper. 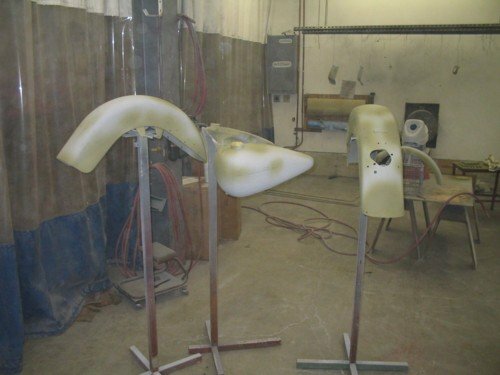 Step 5: The parts receive a single coat of non sanding urethane sealer, prior to color. Step 6: This job is going Hi-Fi Blue with Birch White. 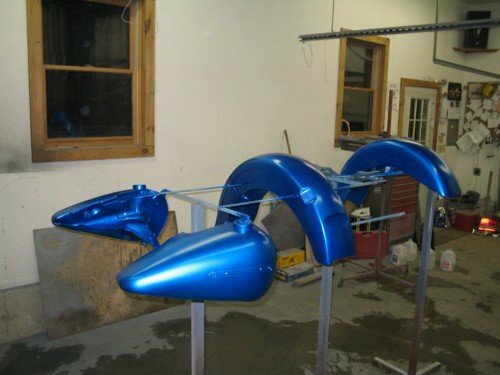 The first step for this color is silver base coat. 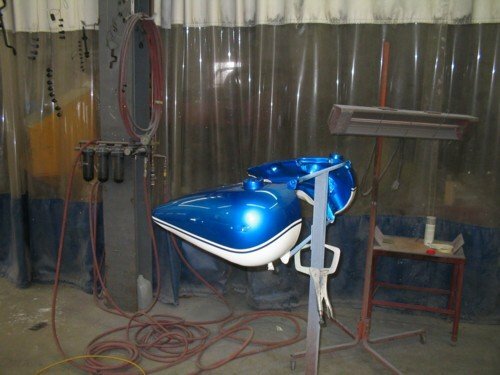 Step 7: After a let down panel is done to check color match, it's time to apply the blue mid coat. The number of coats determine the final shade. Step 8: Apply two coats of clear to all the parts, this keeps any contaminent off of the tanks prior to the two-tone. 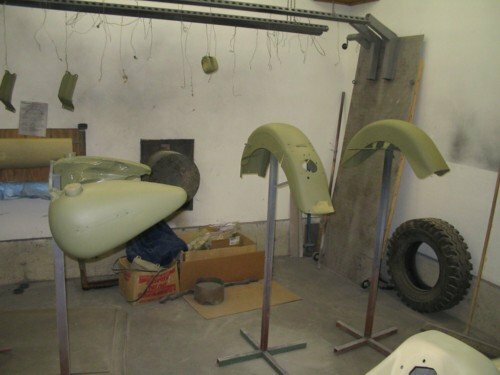 Step 9: Wet sand the clear on the tanks and mask for the birch white. I use a special sealer to keep the white from bleeding onto the blue. 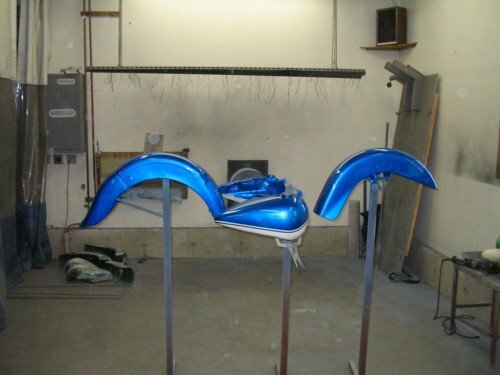 This is available on our paint site. 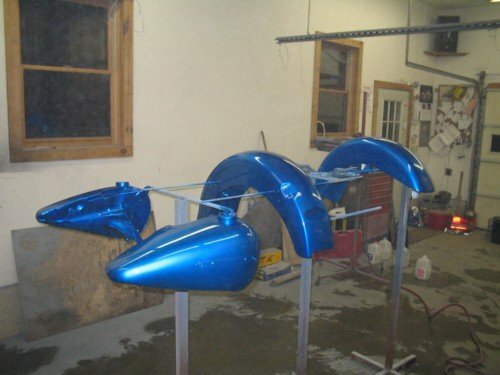 Step 10: A picture of the tanks after the clear coat. Step 11: We lightly sand any dustnibs off the panels, and lightly buff, followed by a polish. Done: The hi-fi colors are the hardest, because of the amount of steps, and the possibility of mistakes. They also are the most attractive and yeild a handsome looking job. The urethanes are very durable, it's not uncommon to see a 15 year old job shining like new, with minimal care. Laquer or acrylic enamel lasted an average of 4 years. 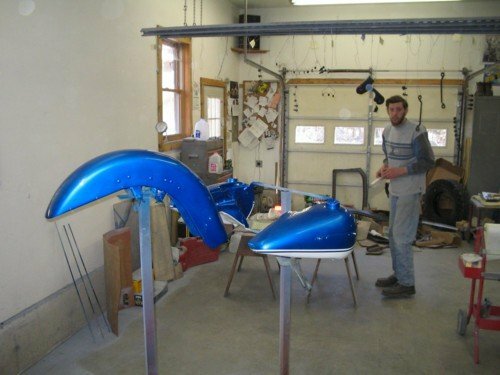 At the OEM level, the hi-fis were enamel, and lasted a single season in the sunlight.